We are a startup World Micro Stock Exchange is a generation next crowd multiple investments without capital in the market through our big data crowd finding management under the provision of micro shareholding value proposition will be generated attached in our every franchise/account holder of World Micro Stock Exchange advanced MRP planning of buy/sell/invest and listing IPO for every consumers/producer/all industry and government will free burden from poor sale, marketing, poverty, unemployment, finance, market volatility. We are a startup World Micro Stock Exchange is a generation next crowd multiple investments without capital in the market through our big data crowd finding management under the provision of micro shareholding value proposition will be generated attached in our every franchise/account holder of World Micro Stock Exchange advanced MRP planning of buy/sell/invest and listing IPO for every consumers/producer/all industry and government will free burden from poor sale, marketing, poverty, unemployment, finance, market volatility, and stop all cash crime, corruption and dirty politics and hours systems of greedy political, corporate giant and government staff. 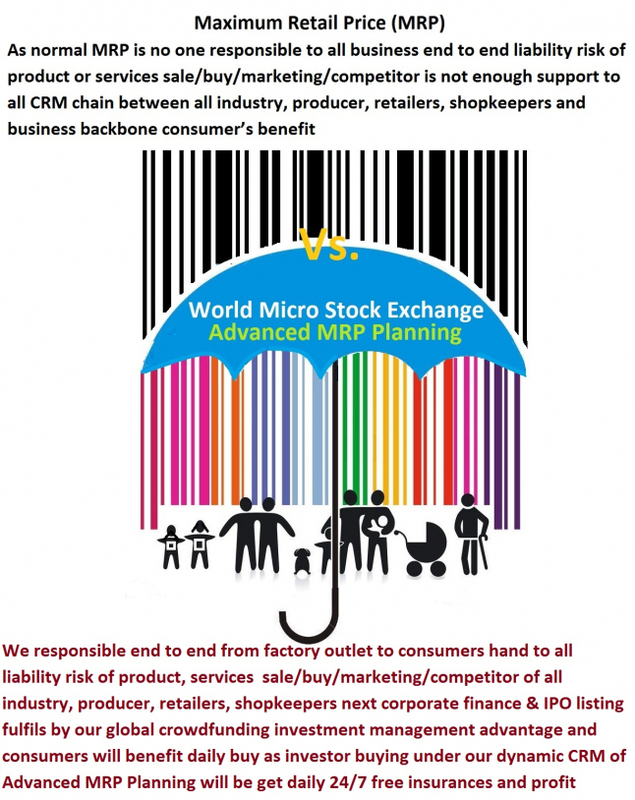 As normal MRP is no one responsible to all business end to end liability risk of product or services sale/buy/marketing/competitor is not enough to support to all CRM chain between all industry, producer, retailers, shopkeepers, and business backbone consumer’s benefits. We responsible end to end from factory outlet to consumers hand to all liability risk of product, services sale/buy/marketing/competitor of all industry, producer, retailers, shopkeepers next corporate finance & IPO listing fulfills by our global crowdfunding investment management advantage and consumers will benefit daily buy as investor buying under our dynamic CRM of Advanced MRP Planning will be getting daily 24/7 free insurances and profit sharing/booking with micro shareholding value proposition loyalty e-share certificate portfolios daily earning/pension.